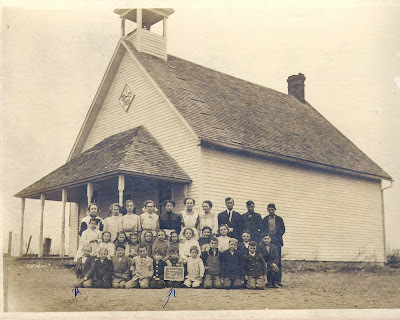 Memories of a one-room country school in Macon County, Missouri. What was it like, and what remains? 12/21/2018: We recently learned that former Bohannon teacher Maudie Ratliff passed away last summer (2018) one day shy of her 90th birthday..
12/21/2018: We also recently learned that former Bohannon teacher E Wayne Phillips passed away last summer (2018) at the age of 94..
3/2/2018: Added information about former teachers Josie Cole, Edith Cole, S. B. McCollum, H. B. Wheeler, Margaret Williams, and Iva Shale (page 121.html). 3/2/2018: Paul Toops provides names of students from 1953 (pages 126.html and 128.html). 3/2/2018: Ruth Masten provides additional teacher and student names (not yet fully updated). 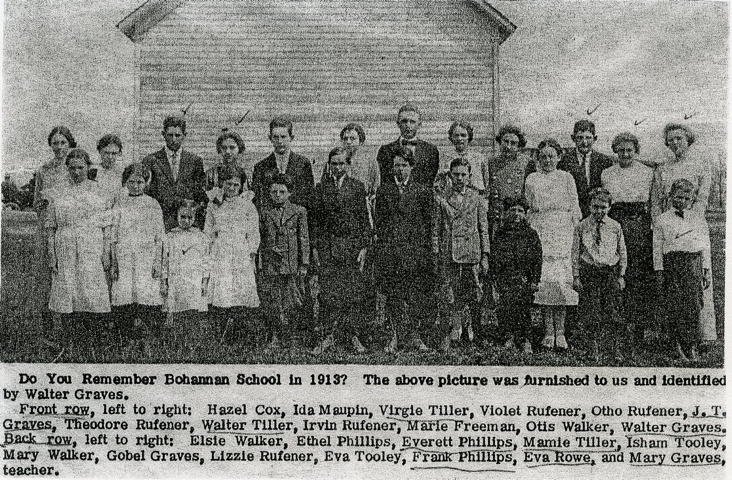 In the 1940s and 1950s Bohannon School was one of many one-room, rural schools in Macon County, Missouri. It was located about seven miles south of Anabel, an hour west of Hannibal, on the south side of what is now called Mahogany Street. At that time local lore held it was named for the donor of the land on which it was located. By the 1960s, all of Macon County's rural schools had ceased operation. The school was across the street from the Manley Graves place on a dirt road, about a mile east of the gravel road between Anabel and Woodville. 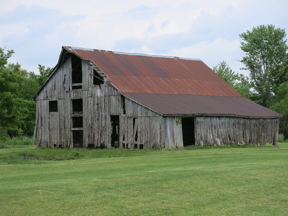 Manley Graves' old barn is the only structure remaining from that era. The schoolyard is now farmland, all traces of its former use obliterated. The schoolhouse, coal shed, outhouses, water well, and playground equipment are all gone. We're capturing some memories of the school before they too disappear. The picture above was probably made in the spring of 1913. When the Trachta children, authors of this web site, attended Bohannon School in the late 1940s and early 1950s, it was customary for itinerant photographers to memorialize school terms. Each student, in those days, got a batch of personal portraits to exchange with friends and family. This picture is probably from such an event. If this is a picture of the same building the Trachta children attended, then it views the back of the schoolhouse, facing east. Manley and Ethel Graves would one day live in the Simon Maupin house (see plat map below), off-frame to the left, and the Trachta's future home, then owned by the Bohannon family, lay a quarter mile forward, down the hill. On these pages, we're capturing available history and recollections of the Bohannon School, and its students. It closed at the end of the 1950s, but some of the teachers, and many of the students, are still with us as of 2017. We're soliciting memories from anyone who knew of the school. If you have such memories please share them with us. The educational pioneering of early, twentieth century, rural America is worth recalling. If you would like to contriubte, send your stories and pictures via the email link in the upper right corner. You can access the entire 1897 plat map by clicking the image. The school is in the upper right of section 14. This 1897 atlas of Middle Fork Township, Macon County, Missouri, shows the school at the same location it occupied the 1940s and 1950s. It gives us the names of landowners in the area, and you will notice many of the surnames of students in the 1913 picture. You can see the entire plat map by clicking the picture. 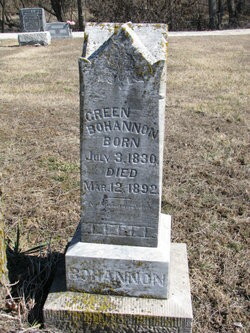 Green Bohannon is buried in Union Grove Cemetery, Clarence, MO. In 1947 the Trachta family moved into a house on the Mary Jeter place. Lee Graves, known to all as Uncle Lee, was still living in the house on the corner, one mile to the west. W. P. Walker's grandson, Owen, was living on his place with our classmates, Larry and Latrelle Walker. Irvin Ruefner, father of several classmates, lived on the Frank Dean place. Everett Phillips, father of classmate Lillie Jean, lived on the Mrs. R. A. Bohannon place. Other students in the 40s and 50s included the Wray children, who lived a mile west on the former Mary Reynolds place. The Kasbeck family lived somewhere around the D. Wilson place. The Hoffmans lived up toward the Walkers. There were many others. Everyone walked to school, of course, except during the famous ice storm of 1949, when some put on ice skates to navigate the heavily sleeted dirt roads. In the above plat map, the school is located on the property of Thomas Bohannon. 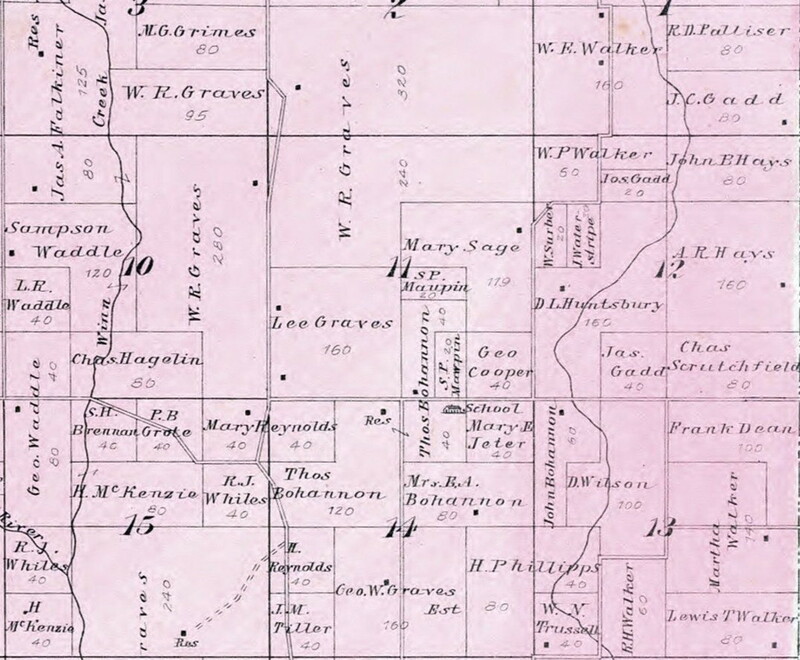 East of it is the parcel containing the future Trachta home site, owned by Mary E. Jeter, and to the east of that is a 60 acre parcel owned by John Bohannon, and to the south is 50 acres owned by Mrs. R. A. Bohannon. Mary Jeter, Thomas Bohannon and Charles Bohannon are children of Green Bohannon, who passed away in 1892. We haven't identified Mrs. R. A. Bohannon, but she might have been the widow of Robert Bohannon, Green Bohannon's brother. These associations add credence to the local lore about the namesake of Bohannon School. The story is further bolstered by an article in the Macon Chronicle-Herald of August 28, 1897, that says the school was named for the Bohannon family, early settlers in the area. It is believed the land on which the school stood was eventually donated to the School District by Everett Phillips' father, Henry Phillips. 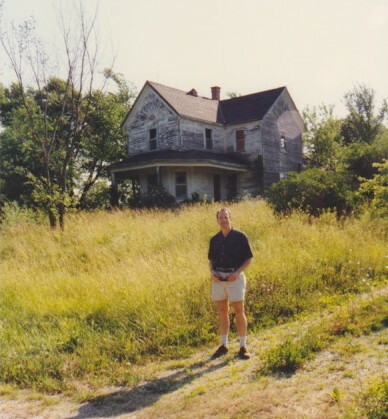 As a further note, it's worth mentioning that Lee Graves' house had been abandoned by 1996, but was still standing (see picture at right). It has since disappeared. Remembering the school and its neighborhood. Manley Graves' Barn, circa 1996. The Trachta house was located on the Mary E. Jeter property, about a quarter mile east of the school. It is not noted on the map, probably indicating it was built after 1897. The Trachta farm included the parcels owned in 1897 by Mary Jeter, and John Bohannon, plus the east half of the Mrs. R. A. Bohannon property. The house indicated on Thomas Bohannon's place was gone by the late 1940s, but there was evidence of a homesite at that location, including discarded household effects. There were also some purposely arranged cherry trees, and a couple of crab apple trees. The Mrs. R. A. Bohannon house of 1897 is also located on the future Trachta farm. It too was gone by that time, over fifty years later, but dishes, a paring knife, and other artifacts were found in that area, and elsewhere. 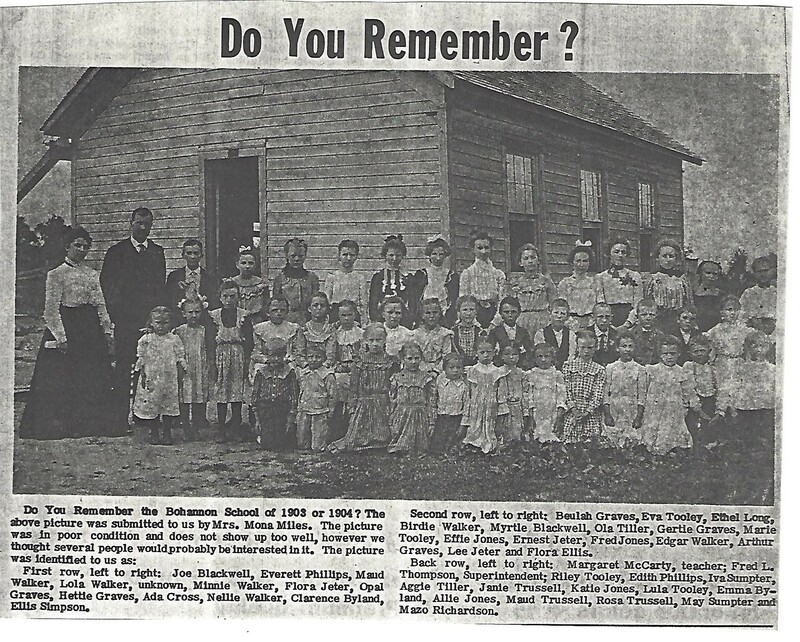 The Macon County Historical Society, and in particular Merlyn Amidei, and Ruth Masten, provided much of the information on this site, including the above class picture, and copies of school handbooks appearing on subsequent pages. Many of the photographs on this site are from the personal collections of the Trachta family. We hope to hear from others, students, teachers, and neighbors, willing to share their memories and pictures. Link to the Macon County Historical Society. On subsequent pages, you will find the available information about teachers, and the year(s) they taught. When available, selected pages of school district handbooks have been scanned and presented. These tell us the names of teachers, and some of the students. We have included some stories and reminiscences from the Trachta family, and will present others as they become available. and very much as it looked in 1953. 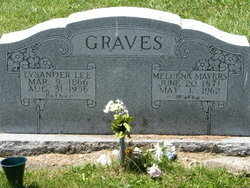 Lee Graves is buried in Anabel, Missouri. Link to the school restoration project at Nickellton, Missouri. Lee Graves, who lived in the house pictured above, was often seen sitting on the front porch. He was reputed to have an unhealed war wound, apparently from the Spanish American War, and was universally known and respected in the neighborhood. He passed away a few years after the Trachta family left the area. He seemed to own a large acreage, which was farmed on a rental or shares basis by his neighbors. Irvin Ruefner farmed a good bit of it in the early 1950s. We should mention that some of the old Missouri rurual schools have been preserved. At left is the story of one, the Nickellton School, in north Macon County, Missouri, saved for our time by a former student, Willie Borron. We received this picture from Ruth Masten, of the Macon County Historical Society. The year is probably 1904, since Frank Manning has been identified as the teacher in 1903.
Who in the world cares about Bohannon School?